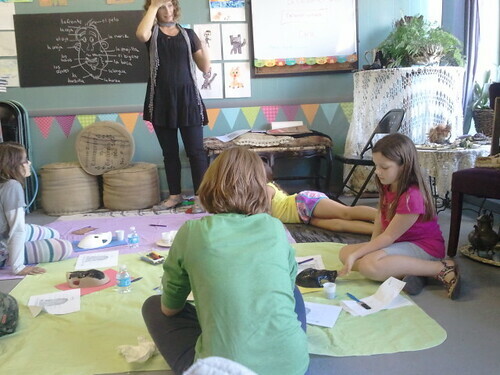 Today we attended the second of four classes in this series at the Butler called “Painting With Clay”. 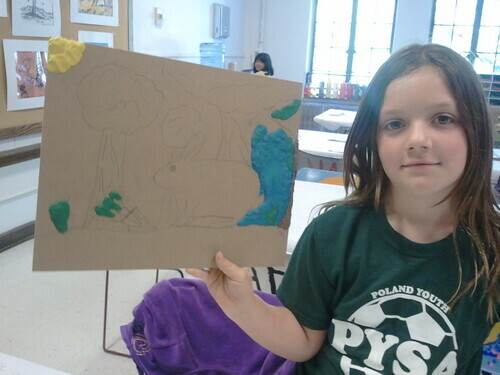 Last week, the kids sketched designs in a large coloring-book style and then traced them onto cardboard pieces. 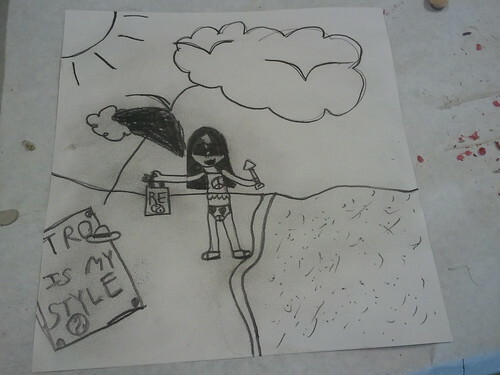 This week, they have started “painting” them in with non-hardening modeling clay. 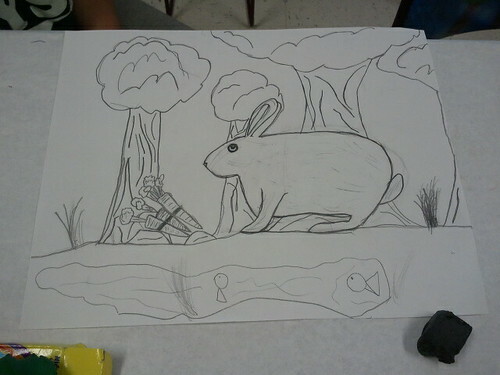 I was finally allowed to see O8’s drawing, which is of a rabbit and some carrots next to a pond. After class, we had lunch at the park with some friends, then headed over to Spanish class at 2 Bisous. 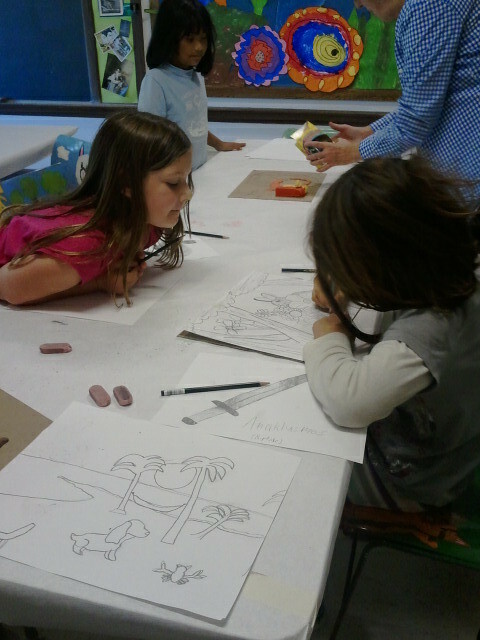 Today we attended our first art class for the fall season at the Butler. This series is called “Painting With Clay”. 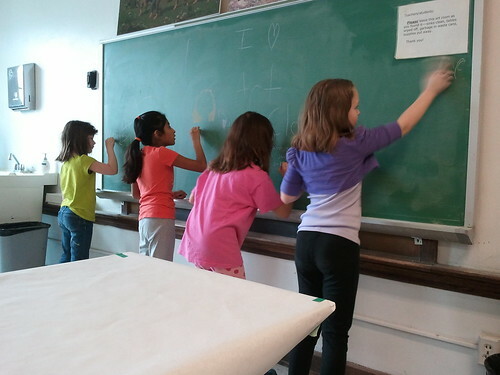 The students will draw a design, trace it onto a base board, and then use modeling clay (sculpey) to “paint” the design. 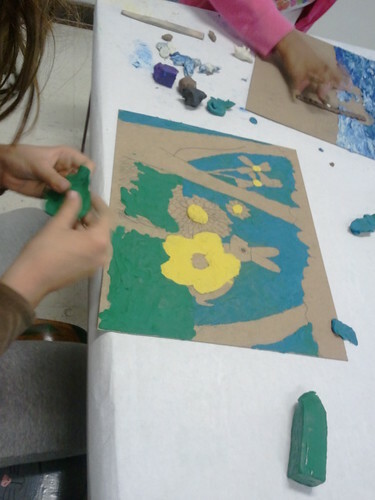 Because they will be using clay, Mrs. George encouraged them to draw large, coloring-book-style pictures that could be easily filled with the bulky medium. 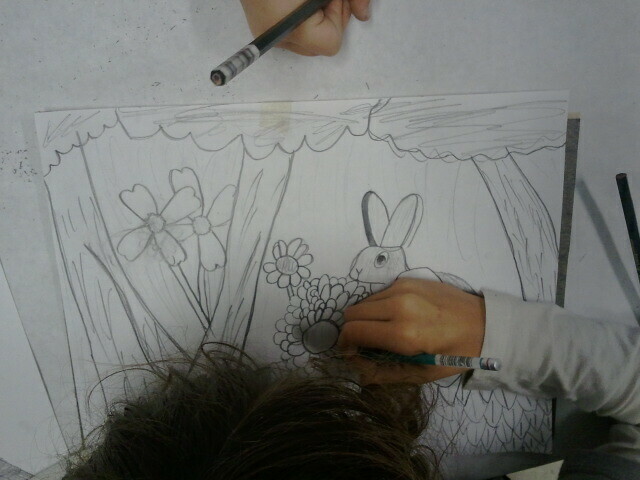 Both girls drew rabbits in their designs. O8 said I was not allowed to see hers yet, but S10 was eager to show hers off. Afterwards, we went to our first Spanish class at 2 Bisous, a new language studio that just opened a town over. 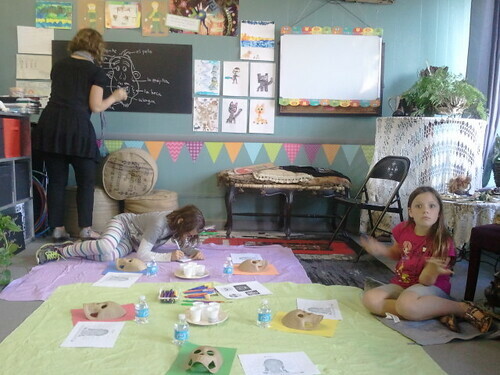 The kids learned about Day of the Dead and the parts of the face in Spanish. 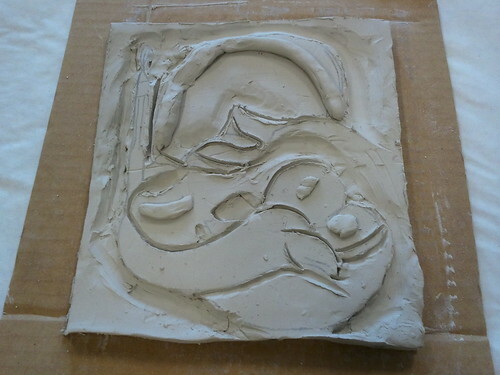 Today we had our third of four “Clay Relief Masterpieces” classes at the Butler. 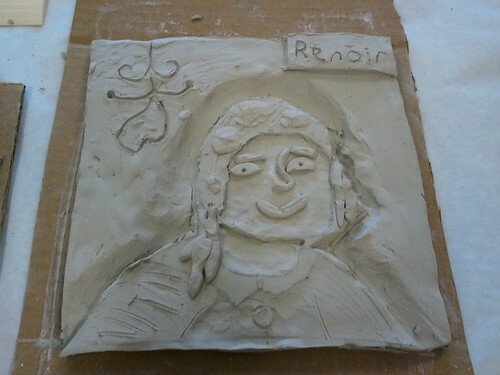 The kids worked on the clay reliefs and mostly finished them today. 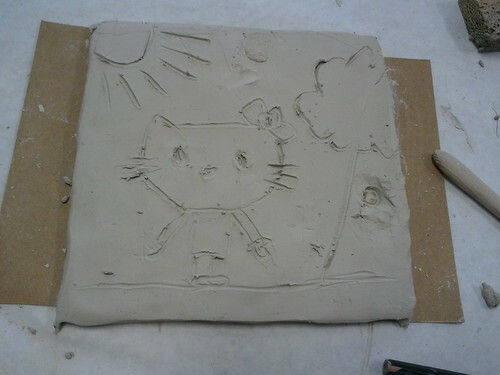 They had a little extra time, so they each got to make a second clay relief of whatever they wanted. 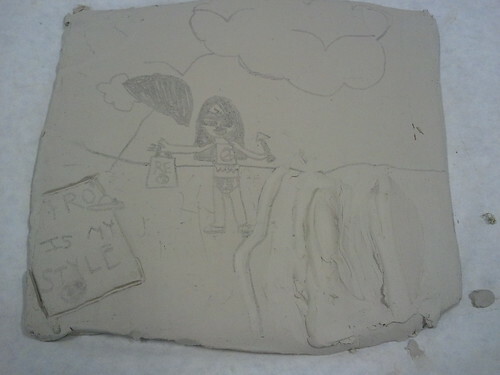 Mrs. George had them sketch in soft pencil, then they transferred their designs to a clay slab. They will paint their clay reliefs next week, after they’ve had a chance to dry. 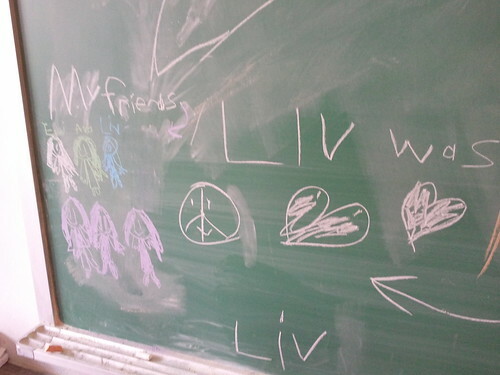 After class ended, the kids drew on the chalkboard while we adults chatted. 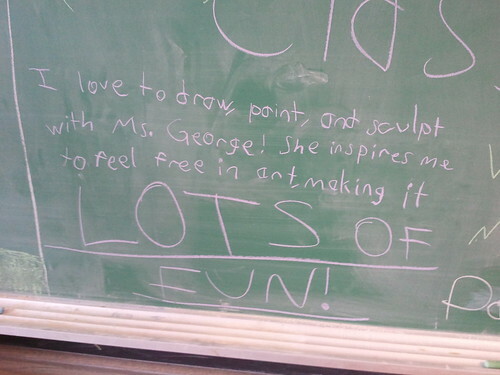 S8 has some pretty strong opinions about art class, apparently. Even the reticent O7 joined in the writing fun. In the evening, we attended our regular gymnastics class at OGI.